This is a splendid little history book for young readers that tells the story of one of America’s many unsung heroes of World War II, Lieutenant Jack Montgomery, a member of the Cherokee Nation from Oklahoma who earned the Medal of Honor during the Battle of Anzio. Michael P. Spradlin writes in a straightforward manner that both entices young readers while using challenging language and concepts that make this an excellent meld of history and biography. The author begins by recounting how Jack Montgomery grew up poor during the Depression and Dust Bowl, originally joining the Oklahoma National Guard in 1937 to make some extra money. When Pearl Harbor was bombed, like millions of other young men serving in the Army he heads off to war not knowing what to expect. The story then follows Lieutenant Montgomery and his comrades in the 45th Infantry Division, composed of troops from Oklahoma and other southwestern states, including large numbers of Native Americans. 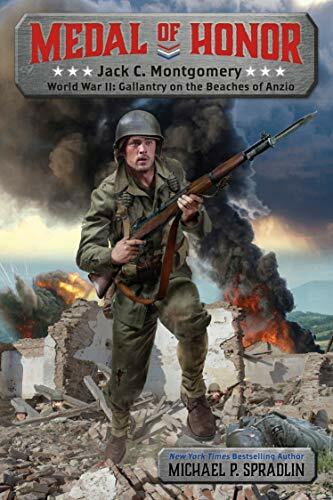 Montgomery and his men gain valuable combat experience in Sicily and fighting up from the beachhead at Salerno until they become part of the invasion force that storms ashore at Anzio in January 1944. The author then narrates the amazing story of how Montgomery earned his Medal of Honor. When his platoon is pinned down in combat in February 1944, Montgomery single-handedly attacks three fortified German positions defended by machine guns, wiping out all three positions and killing or capturing over 40 Germans. Shortly after this action, while under heavy German artillery fire, Lieutenant Montgomery is seriously wounded by shrapnel and evacuated, eventually returning to the U.S. where he undergoes a lengthy convalesce before being presented with his Medal of Honor by FDR in January 1945. The author concludes this short volume by noting Montgomery’s modesty about his actions and continued service to his fellow soldiers. After being discharged from the Army, he worked for the Veterans Administration in Oklahoma until his death in 2002. It is hopeful that his book will inspire young readers to learn more about America’s many silent heroes. Spradlin not only provides excellent maps and illustrations, but a comprehensive glossary and detailed bibliography, making this what is a starting point for enjoying history by young readers. Jerry D. Lenaburg is a Project Manager and Military Analyst with 30 years experience in government and industry. A 1987 graduate of the U.S. Naval Academy, he served as a Naval Flight Officer from 1987–1998 and has published in the Journal of Military History.